Even though I had spent a great amount of time driving to Billings and back, I made a decision Sunday to take another drive. 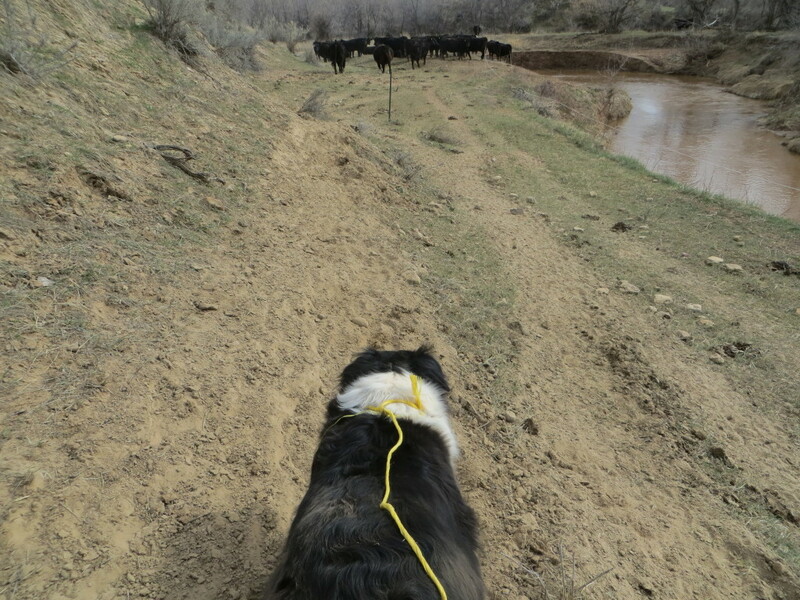 Dally was in standing heat, and, I thought, it’s now or never… so I made plans to drive south this time to a stud dog near Shoshoni, Wyoming. A couple of years ago, I had bred to Bubba at the same place. 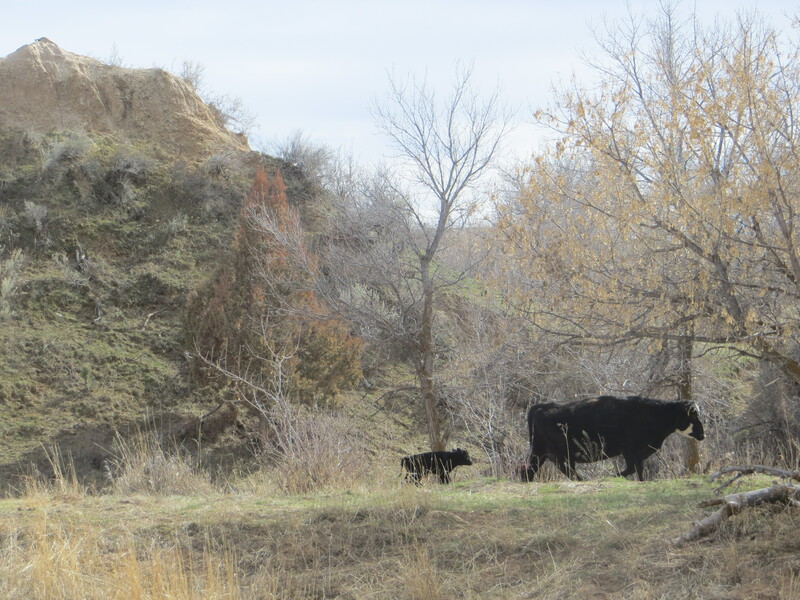 Bubba has since gone on to work cattle in the Great Prairie in the Sky… and I thought his son was standing in his place. Unfortunately, that dog had come to an untimely, early, and freak end… but, yes, S. had *another* male. We discussed pedigree, and temperament, and working instinct, and looks. He sounded pretty good. As soon as Vernon was ready, we’d go! Guaranteed, you plan something like that, and COWS KNOW. They really do. They have an early morning meeting and decide that the grass is definitely greener on the other side of the creek, and, hey, it’s even better when they can mess up your plans… and off they go. Vernon had already fought a bunch out of the bushes, but some more had crossed over the creek, and would I come help? Dally and I were obliging. Cows were stacked against the electric fence that creates a “water gap” or someplace to get a drink. If we shoved them the wrong way, they’d plow over the little fence and wire and we’d be in Big Trouble… so I put a line on Dally. Tight quarters and the first time she’s worked cows in months… it was a good precaution. Finally, with her behind them and the cows headed in the right direction, I dropped the line. Oh, yeah. This girl is made for this! Of course, if that was all we had to do, that would have been too easy. 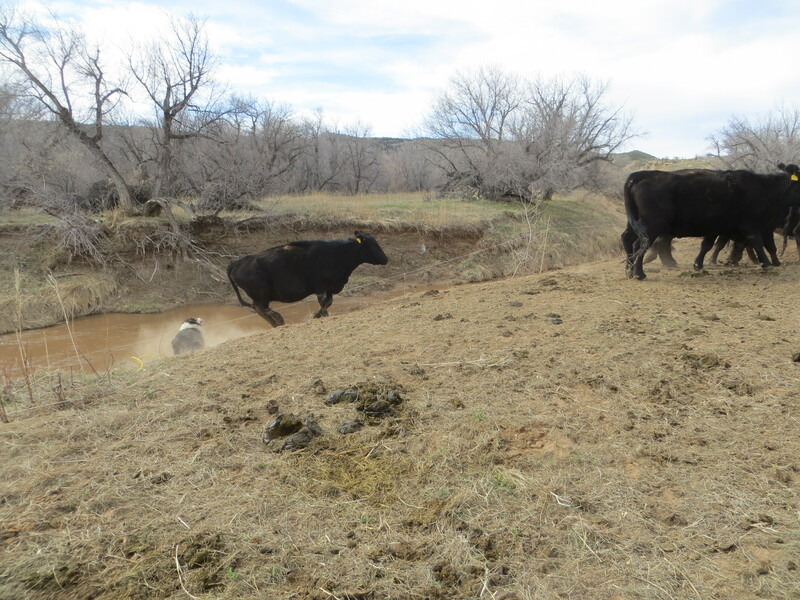 There were the other cows across the creek… and when we got those back, then Brandon and Vernon had to confer about other cows. 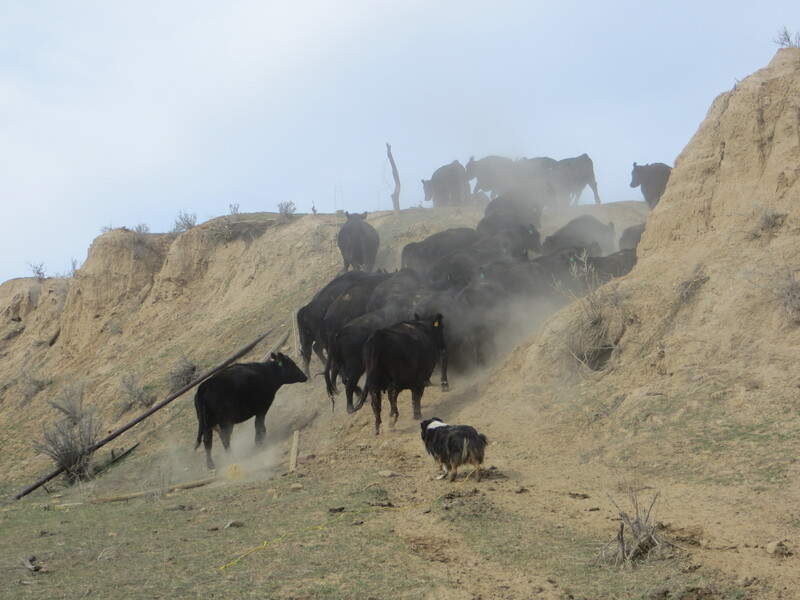 Then they had to ride through the cows AGAIN to make sure nothing was calving. While they did this… I noticed something peculiar. It’s in this photo, but I doubt you’ll notice it. It’s rather neat… but that’s a story for tomorrow. WOWEE!!! That’s a brand new baby, the mama cow still has the afterbirth goodies hangin’ Well something is hanging!! Does the calf have one of those special skin jackets on that you made? So leave us hanging. tee hee And Dally???? Today?? That’s a pretty new little one!